You are currently browsing the tag archive for the ‘Australasian Bat Month 2015’ tag. Flying foxes start to flyout from their camp in Wolli Creek. March is ‘Australasian Bat Month’ & there is a ‘Social Bat Watch’ event on the evening of Friday 6th March 2015 in Turrella Reserve. The event is supported by the Wolli Creek Preservation Society, City of Canterbury Council, Rockdale City Council, Transport Sydney Trains & the NSW Office of Environment & Heritage. Bring a picnic dinner, rug or chair & insect repellent (for the mosquitoes) & watch thousands of grey-headed flying foxes stream out of their Turrella camp. I have done this a few times & it is a glorious experience. 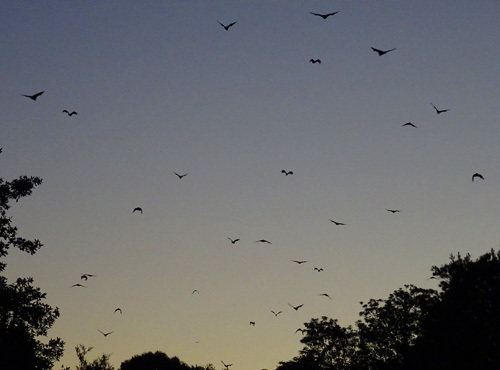 A few bats start flying & within minutes, the camp starts to leave to go hunting for food. Bats fly in a few directions & thousands fly over Turrella Reserve. You get a good view of them. It’s wonderful to watch. I really was awestruck the first time I witnessed this & wondered why I had this on my ‘to-do’ list for so long without actually doing it. We are so lucky to have such nature close to us. Flying foxes are extremely beneficial to the environment & without them, our forests would be in real trouble. There will be ‘Batty Craft’ for young & old & the opportunity to learn about flying foxes. WHERE: Turrella Reserve beside Wolli creek. Enter via Henderson Street Turrella or Finlays Avenue Earlwood. Please note that there are no toilets at Turrella Reserve. WHEN: Friday 6th March 2015. Bring your camera too. You will be wanting to take photographs of this awe-inspiring event.